This is a new polybag that can be found at Toys'R'Us. I mentioned it in my "Polly Want a Baggy" post earlier this year. Bag. Retail is $3.99 for a Price per Piece of $0.09. each piece, and a preponderance of Light Bley. this quad although it's a little on the large side. Score: +10 (A-). This would have scored higher but the lack of extra parts held it back. Oh -- if anyone besides me has been keeping track -- yes, this is my 500th post. Here we are, the last of the Series 3 Mixels. Bag. MSRP is $4.99 for a Price per Piece of $0.08. Parts. A few Bar Plates, a few Clip Plates, plenty of Tooth Plates, some Quarter Travis Bricks, a bunch of Cheese Slopes, some Brackets, a variety of Slope Bricks, and a handful of other interesting parts. Build. I'm calling this the Walking Cannon. Not the greatest angle for a picture, I know. Score: +20 (A+). Another maxed out Mixel. The next to last review of the Series 3 Mixels. Parts. Plenty of Mixel joints, 1x1 Round plates, and Cheese Slopes, a few Clip Plates, a couple Bar Plates, several Large Barbs, a couple of Lampholders, a couple of 1x1 and 1x2 Bricks w/Studs on side and a couple of large Jumper Plates are the things that stand out. ways this could be statted out, so I'll leave it to you to decide. Score: +20 (A). Another maxed out Mixel. This is the point of the review process where things get a little hinky. In this and the next one we'll start looking at some of the non-weapon pieces you can order. We'll start with the Cleaver. As you can see, it's tiny even in the hands of the Classic. I'm not sure it will work as a weapon but you may be able to use it for some sort of greeble. Still not sure why I bought this. It doesn't really fit any scale but doesn't have any problem connecting. Next is the Energy Meter. As you can see, it's a copy of the PK Meter from Ghostbusters. It fits one scale and doesn't have any problem connecting. Here we have the Flashlight. It has a "combat bezel" so the end is a little jagged. It could function as a Lightsaber handle in a pinch. It fits both scales and doesn't have any problem connecting. Flask. This piece, and the next, might function well as a muzzle on some sort of firearm. Or possibly a Single Shot Rocket. Otherwise, beyond being a greeble, I don't see any use for this in MFZ. Scale doesn't really matter and doesn't have any problem connecting. More mecha for you to ogle courtesy of a dead camera battery. Starship Troopers Bugwarrior by Rancorbait. Kind of spindly, but lots of character in this one. updated version of the original Dronex. 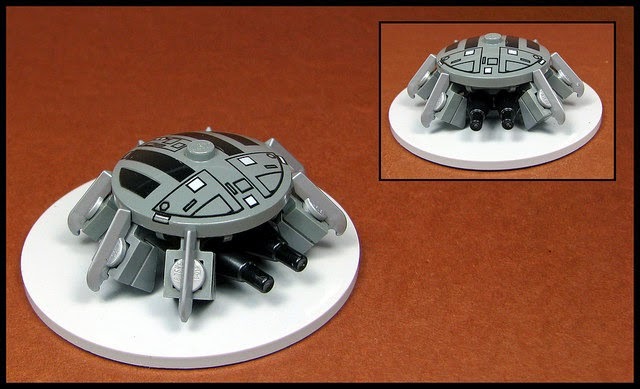 but, a swarm of these on the game table would look great. artist as we started with. Juuuust fiddly enough, I think. The Mobile Frame Hangar will be running its second contest ever. The "Battle for June" has returned! The person that posts the most battle reports in the month of June will win a small Pick-A-Brick cup of Travis Bricks. This contest starts on 12:01am, June 1, 2015 and ends Midnight, June 30, 2015.
a recounting of what happened. Hangar "employees" are not eligible for this contest. To go along with that, apparently Brick Fiesta is having a special MOC category of Mobile Frame Zero Companies. Interesting. Can any MoF0s in Texas, or anyone associated with Brick Fiesta, fill us in? Target is running a sale on Friends, Chima, and Star Wars sets this week. The main ones pictured in the ad at 15% off are 41059 Jungle Tree Sanctuary, 70141 Vardy's Ice Vulture Glider, and 75085 Hailfire Droid. We're heading into the home stretch for the Series 3 Mixel reviews. Parts. Plenty of Plates, Three Clip Plates, two Bar Plates, Mixel Joints, a Clip Tile, Cheese Slopes, some Studless Slopes, Tooth Tiles, a Jumper, 1x1 Round Tiles, a Bracket, giant eyeball Minifig Heads, and large Wings all stick out to me. Getting back on the Mixels review train. Bag. MSRP of $4.99 gives us a $0.07 Price per Piece. Parts. Mixel Joints, small Studless Slopes, Clip Plates of multiple varieties, an Octagonal Bar Plate, Round Plates of two sizes, Claws, a Tooth Plate, four brackets, and some other interesting miscellaneous parts. An interesting set of choices. We're always talking about how Mobile Frame Zero can be played with anything as long as you have an appropriate way to show damage. I saw this "model kit" in Barnes & Noble a while back and finally got around to purchasing it yesterday. Let's take a look at it. Box. I paid $9.95 for it at Barnes & Noble. It is from the sixth series of this line. There are at least eight other series plus large scale single releases. there are are included on the inside of the box. Parts. Two stand parts that are also part of another mech, a gun and some other bit, a shield, a sprue of hands, and the mech itself are what you get. It has a very good range of motion, and even though I don't have a picture, it can do the splits. It's about 25% taller than a Chub. The gun is held in one of the two pairs of hands. The shield attaches to one of the mounting points on the arms. The only drawbacks I can see at the moment is that it only comes with a weapon, a defensive attachment, a possible spotting attachment (that U-shaped piece in the parts bag), and a flight stand so that limits you to the Soldier loadout right out of the box. Also, it can't be taken apart to show the loss of a White die. That being said, I'm sure a squad of these with some extra parts salvaged from other models would look really good on the table. My usual rating system doesn't really work here so I'm not going to try and twist the formula into something that can. Let's just say that a single model costs about the same as a Chub from Mobilefra.me but is less modular so you'll probably need system bars. You'll also be denied the "pleasure" of disassembling it if it takes fatal damage during a game. This frame started out as an experiment with the legs from this design by Luke_BMM. I didn't want to mount them on Pneuma Ts, so I used one of my favorite parts instead. I also decided that I wanted to have a body similar to Dr. Watsman's Beetle 01. From there it was a short step to filling in the space under the 4x2 Double Inverted Slope, Inverted 45 and on the back of the frame. And considering how much fun I've been having with Mixel joints lately it was an easy decision to use 2x2 Towball Plates for the "shoulders". Here are my initial two models. There are links to the Brickshelf galleries in the captions so you can see them from multiple angles. Unfortunately I still don't have a name for this design. My wife called the Brown one -- which was built first -- the Turd Bot. Regrettably the name has stuck in my head. I've had fun collecting the parts for a small squad of these over the last few weeks. I've constructed a parts list with a range of colors so that you can build them in a similar set-up to mine. I haven't included the arms on the parts list as you can make them to fit what you desire. Format = Part Number, Description, Quantity, Colors. 4871 Slope, Inverted 45 4x2 Double (x1) Black, Blue, Blue-Violet, Brown, Dark Blue, Dark Bluish Gray, Dark Gray, Light Bluish Gray, Light Gray, Red, Reddish Brown, Tan, White, Yellow. 3660 Slope, Inverted 45 2x2 (x2) Black, Blue, Blue-Violet, Brown, Dark Blue, Dark Bluish Gray, Dark Gray, Light Bluish Gray, Light Gray, Red, Reddish Brown, Tan, White, Yellow. 30602 Slope, Curved 2x2 Lip, No Studs (x2) Black, Blue, Blue-Violet, Brown, Dark Blue, Dark Bluish Gray, Dark Gray, Light Bluish Gray, Red, Reddish Brown, White, Yellow. 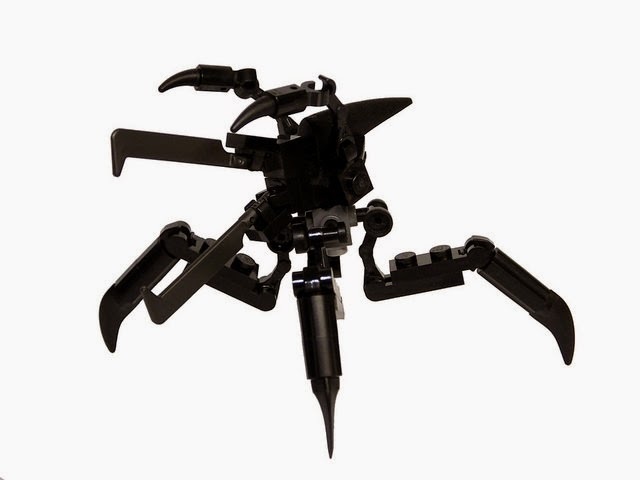 53989 Arm Mechanical, Exo-Force/Bionicle (x2) Black, Dark Blue, Dark Bluish Gray, Reddish Brown, Very Light Bluish Gray, White, Pearl Dark Gray, Pearl Light Gray. 2436 Bracket 1x2 - 1x4 (x2) Black, Blue, Brown, Light Bluish Gray, Light Gray, Red, Reddish Brown, Tan, White, Yellow. 2555 Tile, Modified 1x1 w/Clip (x2) Black , Blue, Brown, Dark Bluish Gray, Dark Gray, Light Bluish Gray, Light Gray, Red, Reddish Brown, Tan, White, Yellow. 3062b Brick, Round 1x1 Open Stud (x2) Black, Blue, Blue-Violet, Brown, Dark Blue, Dark Bluish Gray, Dark Gray, Light Bluish Gray, Light Gray, Red, Reddish Brown, Tan, White, Yellow. 44302 Hinge Plate 1x2 Locking w/2 Fingers On End (x2) Black, Blue, Brown, Dark Blue, Dark Bluish Gray, Dark Gray, Light Bluish Gray, Light Gray, Red, Reddish Brown, Tan, White, Yellow. 15571 Slope 45 2x1 Triple - w/Inside Stud Holder (x2) Black, Blue, Bright Light Orange, Dark Bluish Gray, Dark Green, Light Bluish Gray, Orange, Red, White, Yellow, Pearl Gold. 2654 Plate, Round 2x2 w/Rounded Bottom (Boat Stud) (x1) Trans-Clear, Trans-Dark Blue, Trans-Light Blue, Trans-Medium Blue, Trans-Neon Orange, Trans-Orange, Trans-Yellow. 3731 Plate, Modified 2x2 w/Towball (x2) Black, Blue, Light Bluish Gray, Light Gray, Red, Reddish Brown, White, Yellow. 4623 Plate, Modified 1x2 w/Arm Up (Horiz. Arm L. 6mm) (x2) Black, Blue, Light Bluish Gray, Light Gray, Red, Reddish Brown, White, Yellow. 2540 Plate, Modified 1x2 w/Handle on Side - Free Ends (x1) Black, Blue, Light Bluish Gray, Light Gray, Red, Reddish Brown, White, Yellow. 3023 Plate 1x2 (x1) Black, Blue, Light Bluish Gray, Light Gray, Red, Reddish Brown, White, Yellow. 4274 Technic, Pin 1/2 (x2) Blue, Light Bluish Gray, Light Gray, White. Here's another one I built recently. I hope you enjoy building these as much as I did. Or, why you should be a member of the four major places where MFZ is discussed. 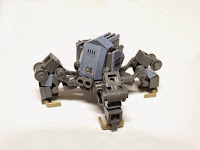 MFZ Flickr Group -- Do you like looking at pictures of cool mecha made of Lego? Yes? Then you should be a member. It's been around since the game was called Mechaton and has over 6,000 photos from the community. It has plenty of amazing constructions to gawk at and ideas to mine. MFZ Facebook Group -- This is actual social media and is probably the quickest way to get whatever you want to talk about, you want to show off, or question you need answered in front of the most eyes. It also has an attention span measured in milliseconds so don't expect any long term discussions or results from here. MFZ Google+ Group -- Similar to the FB page, but slower in terms of actual turnover of ideas. The comments are also a little more thought out and there's less "Lego spam". Mobile Frame Hangar Forums -- For any matters needing long term discussion, this is the place you need to be. Comments and constructive criticism on your builds, a place to find other players, official background, long and short-form fan fiction, and a welcoming community are just some of the things you will find on the Hangar. If you plan on being in to MFZ long term then you need to be a member on all four of these pages. It's that simple. I don't normally do sales alerts as one of my Monday/Wednesday/Friday posts, but today is May the 4th and there are a number of good sales going on. Toys'R'Us is running a BOGO40% on all Star Wars merchandise, including Lego, until Saturday 5/9. Target is -- unfortunately -- only running a sale on one set and it's not Star Wars related. It is however, a good deal. This polybag is currently only available at Target. It can be found in the checkout aisles. Bag. I purchased it for $3.99. Which gives us a $0.09 Price per Piece. Parts. Travis Brick, Motor Brick, Jumper Plate, Trans-color Round Tiles, Bar 1x4x2, Gorilla Fist, Minifig Ray Gun, Bar 6L w/Stop Ring, 2x2 Studless Slope, 2x2 Corrugated Round Brick, 2x2 Mod. Plate w/Wheels Holder Wide & Hole, and Mod. Plate 1x2 w/Racers Car Grille stand out to me. -Effect mecha for RA. It's definitely ugly though. Score: +10 (A-). Not a bad score for a City set. A handful of pieces more and it would have made the max score.